Ground was broken on Tuesday for a new Kannapolis Intimidators (Low A; Sally League) ballpark, marking a milestone for the upcoming downtown Kannapolis venue. 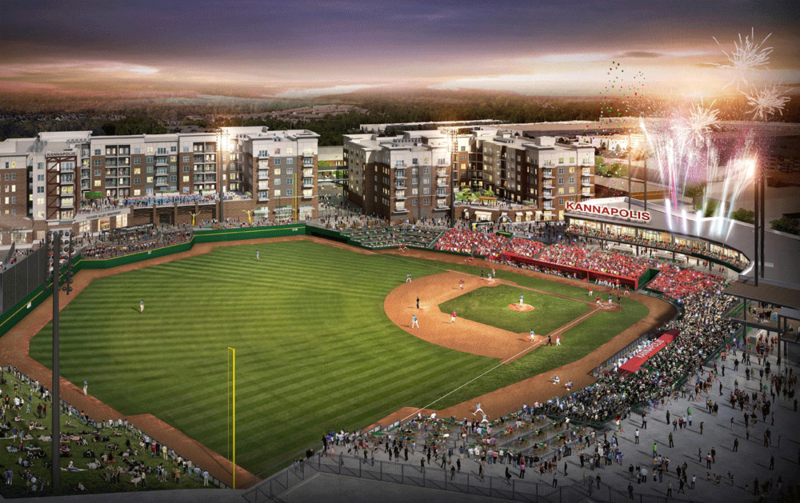 The Intimidators are planning to move into a new $52 million ballpark in 2020, part of a larger downtown redevelopment initiative. The project took a major step forward last month, when it was announced that new team owner Temerity Baseball, LLC came to an agreement with the city on the facility, formally pitched as a Sports and Entertainment Venue. City Manager Mike Legg said the venue has already resulted in commitments by private investors for adjacent mixed-use developments valued at more than $100 million. Legg said the new facility will feature three times the number of places to purchase concessions and 10 seating options as opposed to three at the Intimidators’ current stadium. Construction is currently scheduled to be completed by April 2020. The venue is designed to also be the home of various other activities such as concerts, a public park with restrooms, 6,000 square feet of event/meeting space, a kid’s zone and more. It will have a seating capacity of 4,930, with 3,218 fixed seats. Other seating options will include luxury suites, a party deck, berm seating, dugout box seats, a picnic terrace, an outfield bar, right field boxes and 6,000 square feet of club/banquet space. Rendering courtesy City of Kannapolis.